﻿A question we frequently get asked is “what difference is there between the Gen2 and Gen 3 Magpul PMAGs?” Today we’ll take a look at the differences and similarities between the two. 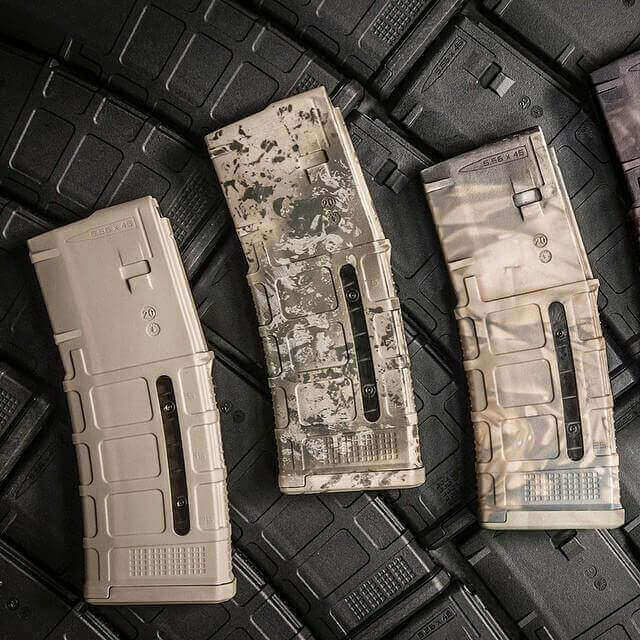 In 2015 Magpul stopped producing the colored variants of Gen 2 MOE PMAGs. They offer a windowed version as well, but no colors other than black are being produced. It may be possible to find some colored PMAGs that are still being sold, but in the months to come the supply should dry up. The Gen 3 PMAGs are being produced in Black & Sand colors in windowed and non-windowed as well as a newly introduced 40rd magazine. The theory behind the Sand color is that the user can customize the magazine to any color or pattern they want with Rit Dye (which is very inexpensive). A few examples of the possibilities of the Sand PMAGs & Rit Dye. -Included Dust Cover. One of the most obvious features of the Gen 3 is that it comes with a dust cover included. There are dust covers available for the Gen 2 magazines but they must be purchased separately. The dust cover is useful in keeping debris out of your magazines while in storage as well as protecting the feed lips from damage while not in use. It should be noted that Gen 3 dust covers will NOT fit Gen 2 magazines. A common misconception is that the dust covers were designed to keep pressure off the feed lips when fully loaded. This, however, is not true. The design of the dust cover was only to protect the feed lips from impact damage (like when stored unsecured during transport in an ammo can or similar hard case). -Over-insertion tab. The Gen 3 PMAGs have an over-insertion tab along the back of the magazine to prevent the magazine from going too far when reloading the rifle aggressively. -Floorplate. The floorplate on the Gen 3 has a slimmer profile than the Gen 2 which can make it easier to fit into tight mag pouches. -Marking Dot Matrix. Located at the bottom of the magazine is a dot matrix that the user can fill in with a paint pen to mark their magazines (Mag 1, 001, 002, IKE etc). -Increased durability. The Gen 3 PMAGs are made of a stronger polymer (see below) that holds up better to wear and impact. They have a different follower that is grey in color compared to the brown follower on the Gen 2. Both generations of magazines are very reliable and last for thousands of rounds. However, magazines are disposable items and should be replaced when they reach the end of their life cycle. Here are some videos from Magpul’s YouTube Channel that show testing of the Gen 3 PMAGs vs USGI mags. There are 9 videos in total so see the end of the article for the rest of the videos or you can view the entire PLAYLIST HERE. Below is an excerpt from a thread on PrimaryAndSecondary.com. This was posted by an employee of Magpul and it started as an internal document that they used to explain what they do to new staff, CS, etc., and to codify their philosophy of design. It’s been tweaked a bit, and they’ve used it to explain externally why they do what they do. You can view the entire thread by clicking HERE. Building feeding devices for firearms is not a new endeavor, and many materials and methods of construction have been employed for this task. For many years, conventional wisdom regarding magazine construction was that metal was the material most suited to the task. Although other polymer magazines were attempted previously (Orlite, et. al. ), the Magpul PMAG became the first generally accepted all-polymer magazine for AR-pattern rifles after its release in 2007. Early military testing drew some criticisms with performance at sub-arctic temperatures and with window material chemical resistance (In the MagLevel window variant). Rumors, assumptions, and outright incorrect information from this early testing and initial evaluations still persist, despite 7 years of materials, manufacturing, and design improvements to the PMAG product line, and millions of fielded magazines in continuous combat use in the GWOT. Current and ongoing testing, both internal and through third parties can easily and thoroughly dispel these rumors and assumptions from any early data. What follows is an explanation of what the PMAG “is”, why it is made the way it is, and why these characteristics provide significant, concrete advantages for professional use of the PMAG over other feeding devices. In essence, the purpose of a firearm magazine is to present a cartridge at an ideal, or at least acceptable, orientation with respect to the chamber, at a defined range of acceptable amounts of resistance to being pushed forward by the bolt, and must be fed upward at a defined range of speeds depending on cyclic rate, within a tolerance range. That range of acceptable geometries and pressures can vary somewhat among rifles. The biggest challenge is maintaining consistency in those variables. If the cartridge is presented the same way, under the same forces, within those windows that are acceptable to the host weapon, every time…you’ll have zero magazine related failures. Various geometries and design features aid that end. Specifics regarding our designs and geometry that may not be immediately apparent are part of our body of trade secrets, although many features can be seen in our patents and applications. Other things, like constant curve geometry, lacking in the USGI solution, are visibly obvious. Constant curve geometry allows maximum round stack stability and consistent follower contact until the magazine enters the magazine well, where some straightening of the stack must occur due to limitations of the AR-pattern magazine well, which was originally designed for straight magazines. The 30-round USGI “dogleg” geometry creates round stack instability/lack of support and attendant issues “around the bend” of follower travel. Not all “constant curve” geometries are the same—how the round stack is supported as it makes the transition to the mag well up to the feed lips, and how the follower supports that transition varies across magazines claiming constant curve geometry. This, and other small nuances in many other details of magazine construction all affect reliability. Through internal testing and the body of external testing that we are aware of, the PMAG GEN M3 has been reliable to an extent that far exceeds any other product or solution. Verification of this claim through additional independent testing is encouraged and welcome. The number one concern in magazine selection has to be reliable function of the weapon system across likely environments and situations. We’ve expended hundreds of thousands of rounds in internal testing, unilaterally as well as side by side with current service tan follower USGI magazines and products from other manufacturers. In both sterile, laboratory environments and under adverse environmental conditions of cold, heat, water, mil-spec dust, etc., we greatly exceed the performance of other options with all ammunition types tested. Almost without exception, interruptions of the firing cycle from firearms in our testing using the GEN M3 PMAG, over the entire body of testing in AR pattern platforms, have been directly attributable to component failure of the firearm (sheared bolt lugs, etc.) or primers which failed to ignite after a positive firing pin impact. Total stoppages for all reasons, including the bad primers and weapons component failure, are in or near single digits per 50k rounds in our testing and the external testing that we are aware of. This kind of absolute reliability, under all conditions, with both AR-based and non AR, but AR magazine compatible platforms (FN SCAR, etc.) has been the goal of the PMAG product since day one, and the GEN M3 product line comes as close to this goal as we are currently capable of measuring. It’s easy to build a brick of plastic, metal, or any combination thereof that fits into a magazine well and will withstand great abuse. Building an extremely durable magazine with the best feeding reliability possible is another achievement entirely, and one we take great pride in. Different materials have different properties, obviously, and they are variably suited to these tasks. We’ve spent a great deal of time testing and examining vast numbers of material, manufacturing, and processing options, both pure and hybrid, and this is the understanding that we have arrived at, which drives our direction. If a material is too soft, it embeds grit too easily, which affects the upward feeding of the follower and round stack and friction for stripping the round. It will also most likely be malleable, and change feeding geometry through deformation in a drop on the lips…or the side wall. Not a crack…but a bend, and possibly an insidious one that will affect feeding, but not be immediately visible. Soft materials also tend to have problems maintaining shape under stress, (such as the pressure of a magazine spring). Polymers that are quite malleable at room temperature and resist cracking, however, tend to fail horribly at temperature extremes, whether hot or cold. Softer, more flexible polymers also usually exhibit creep, especially in feed lips and potentially in the body itself. This allows feeding geometry to change over time, especially at high temperatures. Metals resist embedded material, but overall friction with common materials and finishes is generally higher than the RIGHT polymer. (Cyclic rates on the same firearm can be measurably higher with a PMAG than a metal magazine, although PMAGs keep up with bolt speeds associated with cyclic rates over 1100 rounds per minute.) Reduced friction allows the cartridge to feed with less required energy in the bolt carrier, which aids function in adverse conditions. If a material is too hard, it will shatter. Polymers and even hardened metals, when completely rigid enough to resist any and all deformation, will become fragile. You’ll have 100% consistency in geometry, a resistance to embedded grit, and a resistance to deformation, but this material will fail under rough handling. So, we need a balance of properties within acceptable parameters in all measures, coupled with correct geometry and design features. The last factor we look at, that is the core of our design philosophy, is “resiliency”. This is a “spring” effect, or a desire to return to a rested state/form. Same concept in polymer as in metals, except it’s controlled through composition, reinforcement, and processing rather than hardening/heat treating. Resilient materials tend to perform well across temperature spectrums. After all our testing, a PMAG is what it is as a very specific balance of these properties. A magazine must be rigid/hard enough to maintain feed geometry without deformation and resist problems from embedded grit. It must be ductile or tough enough to prevent shattering under impacts, yet it must be resilient enough to return to the exact same feed geometry without deformation if an impact is hard enough to deflect the material. A choice has to be made, in all cases, over whether it is better to deform or yield at various temperatures and forces, based on limitations of the material. Metal bends, or it breaks, and either option likely changes your feed geometry, at least with all currently used materials, whether the metal in question is the entire magazine or a component part of hybrid construction. The PMAG is designed to have the necessary rigidity while maintaining resiliency and durability across temperature spectrums. This gives us great grit performance, consistent feed geometry, and an impressive resistance to any deformation that would cause a magazine to cause or allow a stoppage. There are many other factors in the design, but we are talking purely material properties here. So…can a PMAG crack? Absolutely, if you try hard enough, with enough force, a crack may appear. Through internal and external testing of the GEN M3 PMAG, this requires impacts or repeated impacts beyond current TOP 03-02-045 testing for firearms systems that we are aware of. It may indeed crack in some extreme cases–however, the forces and impacts required to crack a GEN M3 PMAG meet or exceed those that will deform aluminum/steel feed lips or body material, generally to an extent that will cause enough deformation of the metal to change feed geometry/performance and increase stoppages significantly, if not render the magazine non-functional. The PMAG however is RESILIENT. If it absorbs an impact that will deform other magazines, or even if it does crack, it returns to its exact same orientation and geometry it started with, and certain GEN M3 design features make any damage to or breakage of the feed lips themselves extremely unlikely. We deliberate destroy PMAGS and then test their ability to maintain reliable feeding when cracked or split. A more ductile magazine feed lip material that deforms or bends rather than maintaining resilient form may not crack…but it will likely introduce both simple and complex stoppages into the firing sequence of any firearm into which it is used. Softer, more impact “forgiving” polymer body and feed lip materials have trouble maintaining geometry of feed lips as well as bulging from round stack pressure, creating additional variables. The PMAG is resilient and returns to a set geometry when deflected. Rather than allow deformation that can result in a magazine that may not feed, we would rather accept a crack and a magazine that runs than a softer or more ductile magazine that allows deformation and stoppages. So…material selection is always a trade off of sorts, although different materials perform better over wider spectrums of environmental conditions. A PMAG does what it does based on the full spectrum of performance parameters, and our efforts to optimize across that spectrum. The material we use also achieves those parameters with additional goals of chemical resistance and long term stability, including DEET and all other military standard chemical tests. PMAG body, follower, and floorplate materials are completely DEET impervious. Early transparent window material, used in our MagLevel window, showed some susceptibility to DEET, however current window material easily exceeds 24 hour immersion standards in both 40% and 100% DEET concentrations. Humidity, or lack thereof, at both saturated and dessicated moisture levels, are also tested. After testing hundreds upon hundreds of material combinations in numerous colors, hybrid construction options, and various reinforcement methods, the PMAG GEN M3 is an all polymer, monolithic body of very specific composition, reinforcement, manufacturing techniques, and design, because that is what has worked best out of all the other combinations tried. We continually test new materials, colors, and construction methods, however, in an ongoing attempt to improve in any way we can. An all polymer design gives us the resiliency desired in feeding geometry as well as in side walls and general durability. Going prone or falling on a metal magazine body or feed lips can dent the sidewall in a manner that restricts round stack or follower travel, essentially destroying that magazine’s ability to function. Changes in feed lip geometry, as mentioned above, can also occur. Spot welds can also yield, destroying the body integrity of metal magazines or reinforcements. The GEN M3 PMAG is designed and tested to withstand much greater impacts of this nature than competing designs without allowing damage to the internal round stack or follower which would impede function. All-polymer, monolithic construction also prevents any possibility of separation of components required in hybrid construction methods or failure of welds in stamped metal products, and provides significant cost and complexity savings over hybrid construction methods as an additional benefit. There is a common misconception that the dust/impact cover supplied with most PMAG products is in some way required to prevent feed lip creep or spread over time. This is not the case. When initially loaded, the PMAG GEN M3, and all PMAGs in the current lineup, exhibit a tiny normalization of feed lip geometry within a very small window of time measured in days, and then this geometry then remains stable over many years, heat cycles, cooling cycles, and outdoor UV and weather exposure. We routinely load magazines and place them into stable indoor, hot, cold, and outdoor exposure storage to monitor various batches of material. These magazines are occasionally function tested and reloaded with no issues. As implied by the name, the dust and impact cover is indeed designed to keep debris out of magazines during storage, and to provide an extra measure of feed lip protection for magazines in storage, such as stuffed in an ammo can in a tactical vehicle used in off road operations, or for aerial delivery, kicking containers of loaded mags off of moving vehicles, and the like. This ensures that magazines that may normally be out of sight, not maintained, or subjected to delivery handling that is many, many times the normal testing and usage criteria will perform flawlessly after a quick flick to remove the cover. Absolute reliability can be tested according to relatively established protocols and fixture firing. Testing rough handling, drop, and impact characteristics from full weapon or magazine drops or abuse, when considering the true purpose of such testing, has to include firing and not merely visual inspection. Although incredibly resistant to damage, due to the aforementioned resilience quality, the PMAG GEN M3 is designed and manufactured to function correctly even if damage occurs. Part of our internal testing protocol is to damage magazines through extreme rough handling and fixtures designed for the purpose, and then evaluate function. If a PMAG retains rounds, and even if it is deliberately split enough to not retain rounds, but is forcibly held together long enough to be loaded and inserted into the mag well, it will feed. We routinely endurance test individual PMAGs to 200 times loaded capacity. So, an individual 30 round 5.56 magazine must survive 6,000 rounds in a single rifle with no cleaning but routine lubrication. Magazines are completely serviceable after this testing. Additional testing protocols test two magazines to 3600 rounds each with numerous magazine swaps and field firing orientations for usability, catch durability, and “magazine monopod” performance evaluations. We have Thermotrons for cold-soaking to -60F and heating to +180F for drop and function testing. We fixture and trigger release our drops onto polished concrete for repeatable impacts to evaluate all axes of drop testing, dropping the same magazine up to 16 times to test durability at room temperature and at extremes. We do multi-axis full weapon drops at room temperature, -60F, and +180F. We do function testing on these magazines after the drops. Field testing evaluations with internal and external assets are used to evaluate the human interface and product usability in actual usage conditions in real and simulated scenarios. We have large bodies of user feedback from real and simulated combat environments. All magazine products are 100% guaged for dimensional accuracy. Although the processed and manufacturing techniques we use provide for extremely small tolerances, we still hand inspect each and every magazine multiple times before shipping. All this is mentioned not for self-congratulations, but merely to emphasize that we take the quality of our products very seriously, as we know that a military member, law enforcement officer, or private Citizen may rely on the performance of our products in life-threatening situations. Full test protocols for non-proprietary internal testing are available. As mentioned previously under endurance testing, PMAG service life is extensive, providing performance over high round counts and significant abuse. Numerous first-hand accounts of the same complement of PMAGs being used on 3, 4, or more combat tours and workups in-between have come in from end users. Although service life is long, all magazines are consumables at some point. With a PMAG, if it is not cracked, or broken, it is serviceable. If there is a visible crack, even if the magazine functions, it is time to replace it. Even with significant cracking, however, the PMAG will continue to function as designed until it is split far enough that it cannot retain rounds, as the feeding geometry does not, and cannot change without destroying the magazine. Unlike with USGI or other metal or metal-lipped magazines, it is impossible to have a magazine with damaged feed lips that does not function properly, but appears to be serviceable. PMAGs eliminate the large box of magazines in every armory that appear OK, but create stoppages and have been marked by users and turned in, only to be re-issued in hopes the next user won’t notice. Having a positive deadline criteria saves time, resources, and frustration on the range, and is safer for combat troops. This increased performance, features, and all the benefits come at a price that can be entirely competitive with existing USGI aluminum magazines. Magpul fulfilled its contract with the British MOD, delivering over 1.1 Million magazines, in just a few months—ahead of schedule and with the capability to have delivered even faster. Since that time, manufacturing capacity has increased several fold. Magpul Industries is entirely capable of meeting peacetime sustainment needs, higher demand cycles during periods of global activity, and can surge operations to provide massive quantities of all products, with the same QC and production standards, with very short lead times. The GEN M3 PMAG is fully compatible and tested with all currently fielded AR-Pattern rifles including the M16, M4, Mk18, SPR/Mk12 variants, and other rifles of this lower receiver geometry, as well as weapons featuring the SA-80/HK416/IAR magazine well, and the M249 SAW. All platforms are tested unsuppressed and suppressed. The GEN M3 PMAG features a slimmer profile and floor plate design than previous generations of PMAG, with improved texture for a positive grip under wet, muddy, cold, or other adverse conditions, and a paint pen dot matrix for easy marking and tracking. This slimmer profile fits better in magazine pouches for greater usability. The GEN M3 PMAG Features an over-travel insertion stop, which prevents over-insertion of the magazine under stress or vigorous open-bolt reloads, as well as providing an extra measure of durability for weapon functionality after loaded weapon drops or when using the magazine as a monopod. The GEN M3 PMAG features a four-way anti tilt follower with generous dust and grit clearances for performance in adverse conditions, and water drain features for over-the-beach performance. The new material, manufacturing, and design create a reinforced mag catch area, tested to thousands of removal and insertion cycles for positive magazine retention. It is quite literally possible to hang from a PMAG inserted into a magazine well with no negative effects or failure. The MagLevel Window System provides visual indication of remaining rounds in the magazine, and is visible under NVD aid in darkness. Unlike translucent or transparent magazine designs which cease giving useful information after the follower enters the magazine well, the MagLevel system provides round count at a glance down to the last remaining round. The GEN M3 PMAG is currently shipped in Black and Sand for better IR significance performance without paint, or dye process color matching. The GEN M3 PMAG is easily disassembled for end user cleaning and maintenance, and is specifically designed to be impossible to reassemble incorrectly. The GEN M3 PMAG is currently available in standard, 30 round capacity with and without MagLevel Windows, as well as 10, 20, and 40 round capacities. All stated capacities are true capacities…there is no need to download magazines for reliability concerns or ease of closed-bolt insertion.